We took our hard hats home with us. For me, my hat is a reminder of the wonderful builders we worked with. It’s a memory of the family we helped build a home for, the hardworking team, and the tiny bit of Romania I’ll carry with me for a lifetime. 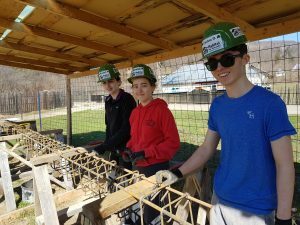 In 2018, Clare Cullen spent one week in Romania volunteering as Team Leader on Habitat for Humanity Ireland’s Easter Youth Build. The team helped families and community members in Darmanesti to build a safe and decent home. Here Clare shares her story. Can you tell me how to get – how to get to Habitat Street? This April, I travelled as Team Leader with Habitat for Humanity Ireland’s annual Youth Build. Our team was comprised of 11 team members, all between the ages of 16 and 18, as well as four team leaders. Months of planning had culminated in a week long building trip to Darmanesti, Romania. We arrived on the site on Monday morning primed for our first day of hard work! The site looked bare and empty on arrival, with just the foundation of the house having been completed. So, motivated to do our best to help – and after an intensive health and safety briefing – we took to our tasks; bending rebar, mixing cement, building exterior and interior walls. In Romania, just over 35% of the population live in inadequate housing. Our time in Darmanesti allowed for the team to see just how much help is needed there: everyday, we drove past unfinished houses, derelict buildings, and homes that looked to need much renovation. As well as being exposed the housing situation, we had a brilliant introduction to Romanian traditions and Romanian culture. Each Habitat trip is a cultural experience and on Thursday evening, we were treated to an authentic Romanian meal that allowed us to try new foods while being entertained by a troop of dancers! One of the most significant experiences I had on this trip was visiting the so-called Habitat Street. Nicknamed by the locals, this is a community built by Habitat staff and volunteers. Each of the homes is populated by a partner family. We were welcomed graciously in to one of their homes, given a tour and presented with sweet treats, while the family told us their story and expressed their gratitude to volunteers for giving them the hand-up they needed to build a future. The efforts made by Habitat for Humanity and volunteers who had worked on these homes were noticed by more than just the local community. The municipality had recognised the invaluable contribution to the area and worked to repave the roads around the area, helping to build a safe neighbourhood for the families there. The partnership between Habitat homeowners, volunteers, and staff, as well as the partnership between the Habitat for Humanity office and local council, is invaluable not only to those families living in poor conditions in Romania, but also to the achievement of the Sustainable Development Goals (SDGs). SDG 11 describes a world where all human settlements are inclusive, safe, resilient and sustainable. The work undertaken by Habitat aligns perfectly with this goal and is a great example of how such a goal can be achieved through these types of partnerships. The team members and my co-leaders made this trip truly unforgettable. The enthusiasm, the willingness to work hard, and good sense of humour displayed by the team consistently was inspiring. The role of a team leader is sometimes tough, but this team made it a pleasure. Learn about volunteering overseas here. Learn about joining Habitat’s ‘Build Solid Ground’ campaign here.